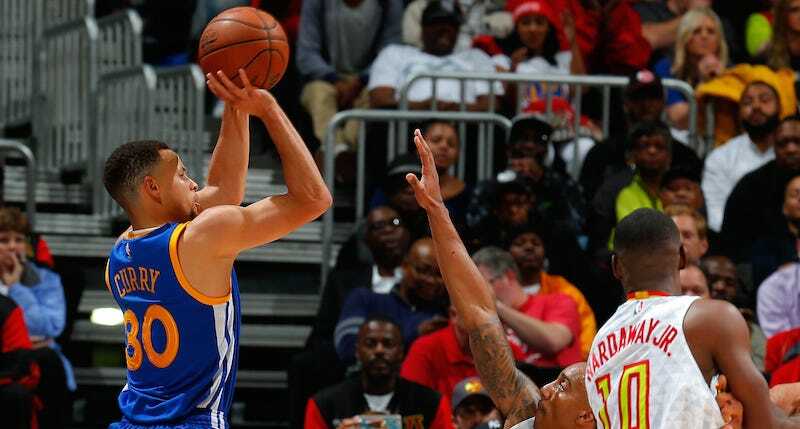 There are few better sports stories than the rise of Stephen Curry, a breathtaking human cheat code who may go down as the best shooter in NBA history. He’s so good, in fact, that NBA 2K doesn’t know how to capture him. For years now, 2K has designed their basketball games to be as realistic as possible, rewarding smart plays and good shot selection. In 2K16, driving to the basket and then passing out for a corner three will lead to far more accurate shooting than, say, trying to create shots off the dribble. Even if a player has a great three-point rating, it’ll be difficult for them to consistently make those low-percentage shots, not unlike real life. For most players. Because Curry has savagely ripped apart the game of basketball, NBA 2K16 doesn’t know what to do with him. Earlier this month, ESPN asked 2K to run 50 simulations of Curry in the ‘15-16 season, and his stats were consistently worse than they are in real life. Notably, in 2K16 he averaged 28.5 points a game; in real life he’s at 29.8. I imagine they’ll need to create a different set of rules that are only active when you’re playing as Curry, which is probably what the NBA should do in real life, too. “We’re going to have to invest even more time in future iterations to really let Steph be Steph in future versions of NBA 2K,” Wang said.